We’d love your help. 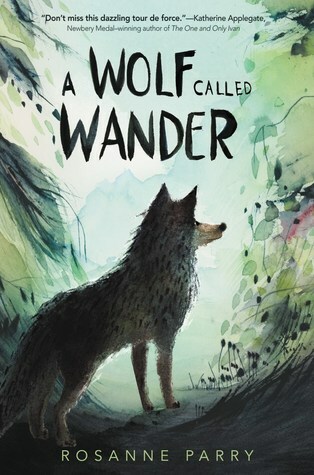 Let us know what’s wrong with this preview of A Wolf Called Wander by Rosanne Parry. Swift lives with his pack in the mountains, until one day his home and family are lost. Alone and starving, Swift must make a choice: st The wolf star, brightest of all in the summer sky, shines over my home ground. I know every hidden lake and rocky ridge, but if my pack is not in the mountains, then it is no home to me. I feel a howl deep inside, but dare not let it out. Swift lives with his pack in the mountains, until one day his home and family are lost. Alone and starving, Swift must make a choice: stay and try to eke out a desperate life on the borders of his old hunting grounds, or strike out and find a new place to call home. The journey Swift must go on is long and full of peril for a lone wolf, and he'll need to take every chance he can. Will he find the courage to survive all by himself? To ask other readers questions about A Wolf Called Wander, please sign up. A huge thank you to Edelweiss and Andersen for a chance to review this book ahead of its release date. In this heartfelt and stunning story, we find ourselves seeing life through the eyes of a wolf named Swift. Even as a pup, Swift was as determined as ever to find a place within his pack. Until one day, their pack is attacked by outsides and displaced. Swift finds himself alone. Without the proper tools to survive, he eats small rodents and insects to stay alive. After he's injured, Swift is vi A huge thank you to Edelweiss and Andersen for a chance to review this book ahead of its release date. In this heartfelt and stunning story, we find ourselves seeing life through the eyes of a wolf named Swift. Even as a pup, Swift was as determined as ever to find a place within his pack. Until one day, their pack is attacked by outsides and displaced. Swift finds himself alone. Without the proper tools to survive, he eats small rodents and insects to stay alive. After he's injured, Swift is visited by a raven who helps him along his journey to find food, water, and even other wolves. Coming face to face with adversaries big and small, Swift travels through the land to find where he belongs. This book is equal parts heartbreaking and equal parts beautiful in so many ways. Not only the wonderful illustrations, but Swift's journey to survive in a world that seems to want to break him. The writing is easy to follow along with and definitely for school-age children. I had no idea this story was based on a real wolf, which made it all the more exciting. Warning: if Bambi made you cry then just be prepared for some fluffy wolves joining in the circle of life. Totally well done, accessible vocabulary, and illustrations throughout make me want to give this to a third grader who wants adventure and to have FEELS. Swift lives near the mountains with his pack; father, mother, and several siblings, including Warm, the smallest and most fragile. They hunt, snuggle in their den, and hunt small animals. When the pack is attacked by another pack, Swift is badly injured and separated from his family. He barely survives, and travels to try to locate his loved ones. His only companion is a raven, with whom he shares some food. This gives him comfort, but a wolf alone is not a happy one. At one point, he sees a female wolf, but she is on the far side of the black river (a highway), and he chases her off so she doesn't get hit by a car. Swift lives on bugs and small rodents, not the quality of food a wolf would expect, while he is healing, and hopes to be able to join a pack of bachelor wolves, but has no luck. At one point, he finds Warm, only to be cruelly separated from him by Warm's death. He misses the mountains, and has to learn the intricacies of his new terrain. Eventually, he is able to reestablish himself, but not as the Swift he once was, but as a new incarnation of himself, Wander. Strengths: Of all the animals in the world, wolves are the ones about whom my students want books! Even Elizabeth's Hall's Child of the Wolves(1995) still circulated in my library until it fell apart. I always enjoy Parry's writing; it is crisp, descriptive, and facile. (Meaning that it seems effortless and is easy to read. Somehow that term seems perjorative, but I don't mean it that way!) I'm NOT a fan of books from an animal's perspective, so it speaks well to the quality of the writing that I was able to read this and enjoy it. Weaknesses: It is unsparing in its descriptions of what life in the wild means-- there is a fair amount of animal violence and gore. On the upside, it did NOT start with a description of Swift being born! Oh gosh, I loved this one, and gobbled it up in one sitting. I won an ARC from HarperCollins through Goodreads giveaways, and I so appreciated the chance to read this awesome story. I have followed the journey of OR-7, the actual wolf who traveled such a long distance through Oregon and Northern California and back to Oregon again. And being a nature and animal lover, I so wanted to understand what would make an animal do this. Rosanne Parry not only wondered, she wrote the story from the wolf’s Oh gosh, I loved this one, and gobbled it up in one sitting. I won an ARC from HarperCollins through Goodreads giveaways, and I so appreciated the chance to read this awesome story. I have followed the journey of OR-7, the actual wolf who traveled such a long distance through Oregon and Northern California and back to Oregon again. And being a nature and animal lover, I so wanted to understand what would make an animal do this. 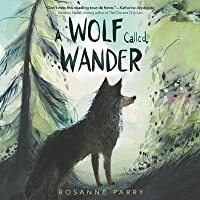 Rosanne Parry not only wondered, she wrote the story from the wolf’s point of view in a manner that is both believable, exciting, and heartfelt. The illustrations sprinkled throughout by Monica Armino lend both charm and comprehension to the story. This beautiful story places the reader squarely in the mind of a wolf separated from his pack. Inspired by the true life events of an actual wolf named ‘Or-7’ aka ‘Journey,’ Rosanne Parry deftly imagines the trek of a pack animal thrust into a solitary challenge. Parry does not shy away from what it means to be a high-tier carnivore. Hunting is visceral and thankfully Parry depicts these scenes with respect for all animals in the food chain as well as accuracy. Here is a beautiful, harrowing middle-grade tale that reads like a classic. Experience a human's educated guess at what life may be like inside the mind of a wolf. Follow Swift through adversity, heartache and over a journey of hundreds of miles to find what he desires more than food and territory--his pack. A middle-grade must read. If you loved The One and Only Ivan, check this out. Just finished this book based on a young male wolf who travelled from North Eastern Oregon into CA becoming the first Grey Wolf in CA since their eradication. This is a quick and easy read told first person from the wolf’s point of view. It’s charming & enjoyable. Looking forward to the finished copy with art work & end notes about OR-7/Journey. Excellent story with a clear voice and plenty of interesting facts about wolves. Good adventure, but it is unflinching about the realities of life in the wild. An easy read. Kept interest until the end. Very well written. Excellent choice for young adult read.